A few months after my 4th of July breakdown, I experienced a moment of break through that empowered me and brought me a breath of life. I had spent the in-between months trying to see and understand why I had been making myself small in life, why I had deemed myself unworthy of love and belonging. Our family was up in Oregon at our family lake cabin. The majority of our family and extended family had decided to go swimming at the communal swim dock in another part of the lake. While everyone else was in the water having fun, I sat in a chair on the dock disheartened because I had forgotten my swimsuit. I guess I would be a cheerleader and observer from the sidelines today. I felt my heart sinking deep in my stomach. Isn’t this how it always goes? Me sitting on the sidelines, watching, while everyone else fully lives? I watched Harper scream with delight as Jeremy threw her into the lake. I felt my soul sinking down into the deep, dark pit of hopelessness. For a moment, I fully embraced the storyline of me being a mom who wasn’t any fun, who did her duty to care for her family but never engaged in the party. I felt trapped and incapable of playing any other role. Having perceived what I was feeling, Jeremy walked over to me and said, “Remember what Elaine has been saying: don’t allow yourself to be small. You still have a choice here.” Elaine was my therapist and in our previous session she had challenged me to find moments where, when all I want to do is be small and fade into the background, that I choose to practice doing the opposite. Instead of living out a life contract of “miserable victim”, I had a choice to make. I stood up and called to Harper to join me at the edge of the dock. “Do you want to jump in with me?” She studied my face to see if I was serious. When I raised my eyebrows and smiled in confirmation, her eyes sparkled and a smile swept over her face – “Yeah!” I grabbed her hand and we counted together, “One…two…three!! !” And there I was in the deep end of the pool with all of my clothes on. Hear God’s call to a deep personal encounter as an invitation, not a reprimand. It is an invitation to step out of the security of your boat and meet Jesus in the vulnerability and chaos of your inner storms. It is an invitation to move beyond objective knowledge to personal knowing. 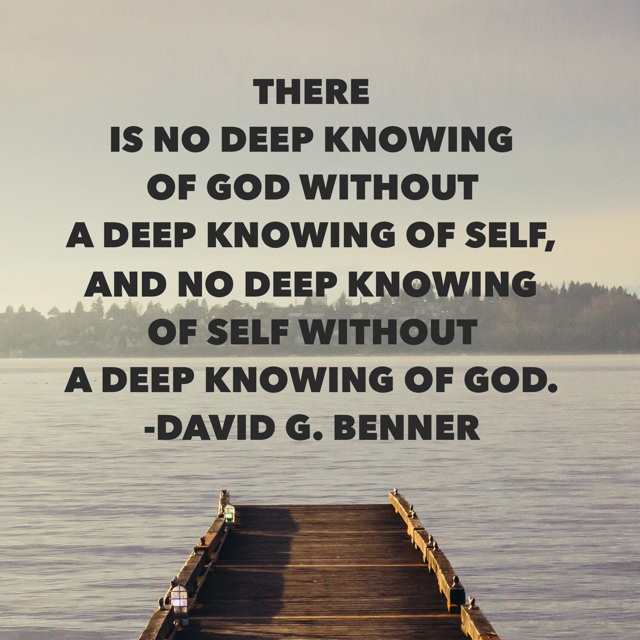 It is an invitation to truly know God. This is the choice we all have in front of us. Will we stay in our boat or will we brave the deep waters? The confines of our boat offer us a certain kind of security and comfort. It’s where we’ve been able to rely on ourselves or the things around us to keep us afloat. It’s where we’ve known much about God and have forgotten who we really are. The boat is where we’ve been small, bound and voiceless. Stepping out into the deep waters takes courage and faith that God will meet us in our need and carry us. It’s the scary place where we leave behind the security of who we think we are or who we have been until now. The deep is where we break contracts we made with ourself years before. It’s where our true self is revealed to us and where we were meant to thrive. The deep is where we get to know God personally and intimately because we are trusting Him to help us walk and not sink. There is no safety net other than a God who is ever so closely abiding with us. The deep is where we find our fullness, freedom and voice. When I jumped into the water that day, clothes and all, I knew it represented more than a mere “carpe diem” moment. I knew I was committing my soul to the deep. To the things God wanted to reveal to me and restore in me as He journeyed with me in reclaiming my soul voice. I’m believing your invitation into the deep is simply awaiting your ‘yes’. Where do you find yourself living today? In the boat or in the deep? < Previous How Do We Find Our Voice?